Fit-Ink: Is Fat-Phobia Good or Bad? I have a confession: I'm a fat-phobe. I don't know if it's a bad thing or if I'm even thinking of a phobia in the traditional sense, but at the given moment I think it helps to explain my affinity for the reality TV weight loss shows and some other reactionary news that follows. My husband tells me this every week when I return home from the gym and demand he cease his Discovery Channel-watching so I can watch the final hour of The Biggest Loser (yep, it happened on Tuesday). And Thintervention. And Money Hungry. And Celebrity Fit Club. And Joy Bauer's Joy Fit Club segment on The Today Show. If there's a scale involved, more often than not you'll find me tuning in. Yep, it's true, although I think it's more for their lifestyle changes, healthy recipes and workout tips that help. But unlike some people--or rather one journalist who's not only trending in the top 10 on Google at the moment but also sparking conversations across social media platforms, friends and acquaintances included (the Fit Bottomed Girls first alerted me), I'm not bothered when it comes to these "fatties" on TV, like when they have to weigh in at the show's start. Even that little fat-phobic section of my brain, mind you. I might not be able to voice it appropriately when making a Facebook comment to a friend (I always, ALWAYS, wonder if I'm saying the right thing in those cases and hoping to not offend in any way, shape or form) but I have good intentions, I promise. And if I have ever offended, or not said enough to show I care, I'm sorry. But before I send off another round of sirens, let me just put this out there: what's wrong with seeing a little representation of society across the tube? You always here that we don't want to watch a bunch of idyllic people moving through life with everything going their way that glazes over the struggles real people face day in and day out. When we're going through a recession, do you really want to watch shows where people buy the items on your wish list and make it look like it's not a big deal? I didn't think so. Did you want to watch ER and see all the emergencies turn out for the best instead of the worst? OK, that's not a good example--I'd love for them to survive--but it wouldn't be real life if the doctors saved all the patients wheeled into the emergency room. So fat people on TV. Isn't that just a representation of today's society? 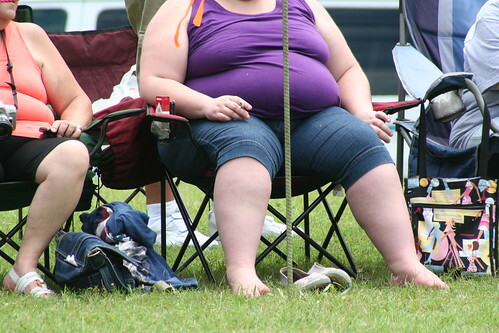 If you go by the numbers--63.1 percent of Americans were either overweight or obese in 2009--then I'd have to say yes. While my personal thoughts might leave me fearing the 4X and 5X shirts--sadly I didn't even believe these existed until I had to order one for a MS Walk participant a few years ago--it stops at what others do, or in this case, look like. To each his own, right? But to answer the editor's question posed to Maura Kelly--"Do you really think people feel uncomfortable when they see overweight people making out on television?" --I'm sure there are some out there who do. But if it bothers you that much, just change the channel. That's what happens at my house when the other party has had a little too much of my Biggest Loser renegades. Or just don't be so insensitive and discriminatory in a public forum. Photo grabbed from Tobyotter at flickr.